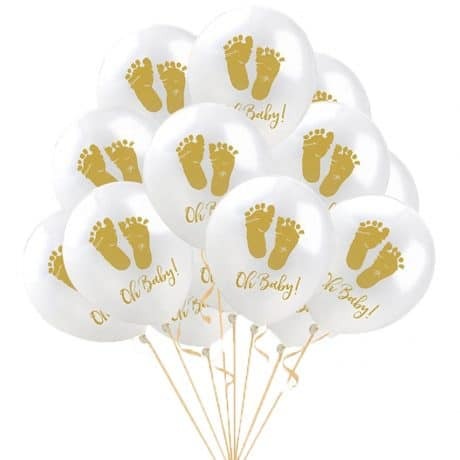 These balloons are a perfect choice for a baby shower. Set included 20 baby balloons. Balloons will arrive deflated and you need to be inflated with a helium tank or balloon pump. PLEASE NOTE: Keep the balloons away from children. Even pieces of broken balloons pose a serious potential choking hazard because they are easily sucked into the throat and lungs. 1. Use HI-FLOAT balloon treatment. It forms a coating inside latex balloons that reduces helium or air loss. It is non-toxic, non-irritating, noncorrosive, nonflammable and biodegradable. 2. Inflate the balloons on the day of the party to ensure that the helium is fresh inside the balloons. 3. Pre-inflate with air before using helium. 4. Avoid over-inflating the balloons or they could burst. 5. Store balloons in a large plastic bag before and after use. 6. Inflate your balloons at the same temperature as their intended use. 7. Coat your balloon with a silicone spray to extend its lifespan.